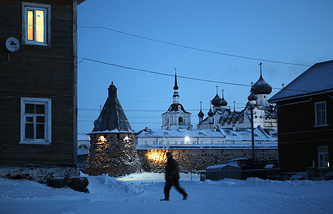 ARKHANGELSK, March 16. /TASS/. More than 70 people will make the Chinese delegation, led by the country’s Vice Premier of the State Council Wang Yang, who will come to The Arctic: Territory of Dialogue Forum, the Arkhangelsk region’s Governor Igor Orlov said in an interview with TASS prior the event. The forum will also host a meeting of the Russian-Chinese intergovernmental group on cooperation . "We are expecting a big delegation of more than 70 people, which will be led by China’s Vice Premier Wang Yang," the governor said. "A meeting of the intergovernmental group on cooperation between Russia and China will take place during the forum." "The Russian side at the meeting will be led by (Deputy Prime Minister) Dmitry Rogozin," he continued. "The Chinese are saying it would be for the first time in their country’s history that a delegation would be travelling that far to the north." The Russian side plans to discuss with the Chinese delegation certain projects, including the Belkomur railway and the Arkhangelsk deepwater port, he added. The Arctic: Territory of Dialogue Forum is a key international platform for discussing problems and future of the Arctic area at the global level. The forum is supported by the Russian government and its objective is to unite efforts of the international community for effective development of the Arctic and for higher living standards for the people living there. The first forum took place in 2010 and was devoted to modern problems of the Arctic region. The second forum in 2011 focused on formation of the Arctic transport systems, and the event in 2013 touched upon environmental safety. This year, the event’s key topic is "People and the Arctic." The forum’s organizer is the Roscongress Foundation. The Fourth Forum will take place in Arkhangelsk on March 29-30. It will feature about 1,500 participants from Russia and other countries. TASS is the general information sponsor.